Rutgers, Idaho and Portland State are the first three Huskies football opponents. Gah. Coach Chris Petersen is nearly begging fans to show up. Clearly, they have better things to do. Despite starting out ranked 14th in the country in the Associated Press poll, following numerous preseason predictions of a potential North Division Pac-12 championship, coach Chris Petersen felt compelled to sell Washington fans on the necessity of coming out to the season opener against Rutgers at 11 a.m. Saturday at Husky Stadium. “For everybody who has season tickets or game tickets, even if they can’t make it, pass them on to their neighbor,” he said Monday at his weekly presser. “It’s just really important to this program. Petersen’s tub-thumping is probably not exaggerated. Washington athletics projects an operating deficit of $14.8 million this year. A part of that is lagging attendance at football games. That helps explain why Petersen feels compelled to offer instructions to fans in how to unload tickets. Next week, for the game against the rapidly disappearing Idaho program, perhaps Petersen will be at the corner of Montlake Boulevard and Pacific Street, handing out Starbucks gift cards to anyone who shows him game tickets. The program claimed an average attendance last season of 61,919 fans, down from 64,508 in 2014 and 68,769 in 2013, Petersen’s first year. But it is difficult to work up much eye moisture for a program that actively annoys its constituency with lame opponents, erratic, inconvenient scheduling and often a better game experience at home than the hassle and expense of live attendance. Do Petersen and his bosses really expect a lot of purple-and-gold gee-whizzery for a morning start on Labor Day weekend against the worst team in the Big 10 that is a 26-point underdog and breaking in a new coaching staff? Followed by a game with the Spuds, who are dropping out of FCS play after this season? Followed by Portland State, which is already out of FCS in the Big Sky Conference? This is the worst schedule since Muhammad Ali booked George Chuvalo, Henry Cooper and Karl Mildenberger. Yes, we know games are booked years in advance. Yes, we know the Huskies are beholden to the vagaries of the Pac-12 Networks schedule, even though it is a dorky monster they helped build. And yes, we know that all Power Five conference programs fill the non-conference schedules with French pastry. But as an entertainment value, this schedule is plainly putrid. Fans don’t have to care about the reasons; they just see that nearly half the seven-game home schedule isn’t worth setting one foot outside the house. 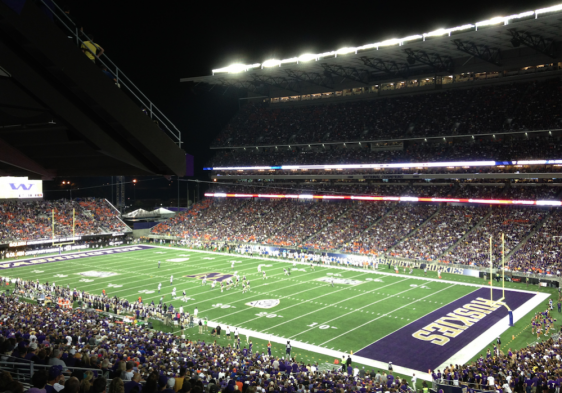 UW competes in the marketplace with one of the most intriguing teams in all of American sports, the Seahawks, as well as the rest of the college football nation whose games can be telecast or streamed into every home, pocket or purse. They also compete with a Seattle September that offers many outdoor amusements. This is not the Southeastern Conference — in which former UW athletics director Scott Woodward now works — where entire small cities relocate into giant stadiums on game day. Five of the Pac-12 schools reside in three of the U.S.’s top dozen marketplaces — busy places with many entertainment choices. Woodward and his fellow Pac-12 ADs helped guide their schools into deficits by making the content of Pac-12 Networks too expensive and unattractive for the main satellite carrier in the huge region, DirecTV. The biggest culprit in the negative numbers around the conference, especially including the smallest market in Pullman, is the revenue shortfall from the P12 nets, not lagging attendance. But it is forbidden to speak ill of the house derelict. So Woodward’s successor, Jen Cohen, chooses to sound bewildered. “We’ve never had this kind of debt before around here,” she told the Seattle Times in June. One of Cohen’s learnings in the top job is that her Pac-12 colleagues have boxed themselves into a revenue corner: They built an unwieldy TV network that fails to serve enough constituency to pay off the facilities arms race in which they have all engaged, while alienating the dwindling die-hards who resent coming to coming to games at 3 a.m. Siberian standard time. Petersen obviously has little say in the business matter. But after a couple of Friday afternoons handing out curbside coupons in the rain, he may have to think about clearing his throat. Yet another Classic, Art. I laughed out loud, in public, when I read this. You’d better watch out, as you may be the next named stadium street, a la Royal Brougham! You made several great points and one of them is the timing of the games. My wife and I used to plan our fall weekends with friends going to 12:30 Husky games – it was a long time, planned entertainment outlet. Now we don’t know when the games start, some start late, getting home past midnight, completely eliminating a day after with friends. The times are unpredictable and even worse (is it possible) they are subject to CHANGE. There is no 100% answer to the Huskies loss of attendance, yet I put forth this dynamic timing is the basis, as it seems to align with the decrease started in 2013.
it certainly is NOT the product, which is obviously better than the years prior. Many fans had seven ritual Saturdays in the fall, like you. That’s no longer possible. Now the ritual seems to be getting your drinking done in the Zone throughout the second half. It is pretty pathetic that Portland State is probably the toughest non conference opponent. I give them a little slack for Rutgers since these get scheduled so far in advance, they were an up and coming team that kind of fell start when the Big East died. But there is no excuse for Idaho AND Portland State, an FCS and a virtual FCS team? One FCS is lame, but somewhat defensible as long as the other two games are decent. They should have 1 legit power 5 team and 1 MT West team every year. The old bromide was an A opponent, a B opponent and a C opponent. This is three Cs. You’re right about the distant scheduling, but this schedule would hurt the Huskies if they get really good and challenge for a playoff spot. spot on Mr Thiel ! I was a 30+ yr season ticket holder who got very tired of my inability to plan ANY Saturday during football season… and that was when we regularly scheduled decent teams. Unfortunately the costs of a ticket astronomically increased along with the cost of the Tyee seat license (even though it wasn’t called that. Try getting a decent season ticket without the extra money) ….the free bus passes from park and ride transit zones ended….the parking areas around the stadium were converted to camper/rv tailgating areas thus ending parking at the stadium for the average guy. I should have mentioned specifically the rising game-day costs that have priced many out of attending. You said it well. Thanks. I blame the Pac-12 execs. I strongly suspect they are trying to maximize the income to the conference and therefore to themselves. After all, the poor poverty-stricken execs have to somehow maintain their multiple vacation homes, private jets, yachts, etc. I understand the need to max out revs, but that comes at a cost — spreading games all over the Saturday clock. Some fans hate it, some don’t mind, and some enjoy a late start that leaves the day free. But when the P12 Nets revs don’t meet the projection, the house of cards trembles. Art, once again you have given us a “treasure trove of prose”. Your Muhammad Ali reference got me laughing once again. As always….great job!! If you can appreciate a George Chuvalo reference, you’re a fine man. Thank you for the compliment… but let us not forget the notable Ray “Windmill” White. Thanks for another great article supporting the Huskies and encouraging fans to come out and support a good team and program. We have enough negativity in this area (see Seattle Mariners) no need to discourage the 60,000 waiting for Seahawks tickets any more. Support the UW and the kids …something good is happening over there. Your job is to support. My job is to be honest. The football should be good. I feel very fortunate I only live in Everett so the odd kick off times don’t affect me much. But college football is supported by alums and long time fans who have moved away, or came from distant towns to go to school in the first place, who travel long distances to attend games. In the recent past at least we got 3 weeks notice as to kick off times. It’s 6 days now. For someone coming from Yakima, Portland, or Spokane, getting 6 days notice of an 8 pm kick off makes attending really difficult. Throw in tenuous pass conditions in November and I can see why people stay home. Hate to say it but CFB has made the fan attending the game an afterthought. The home and homes with Michigan in the late 70s and early 80s–, Don and BO. Epic events for old dawgs. LSU, Ohio State, Notre Dame, etc., helped create real seasonal buzz. UW and other schools diminish themselves when they don’t seek out at least one game against the best. Methinks you protest too much. Five games from now…the world will be eating our of our hands…slug media will be all over the CP Era and how this, sophomore break-out, Rose Bowl Bound team did not surprise them at all. I remember the TV black outs on the Seahawks…you could not even give Seahawk tickets away. Bottom line: Nothing succeeds like success. Win…and they will come. I do not see a deficit in the coming years…I see a National Championship on the horizon. woof! I didn’t say anything about the quality of play. I said from the day of his hire that Petersen is the best since James.